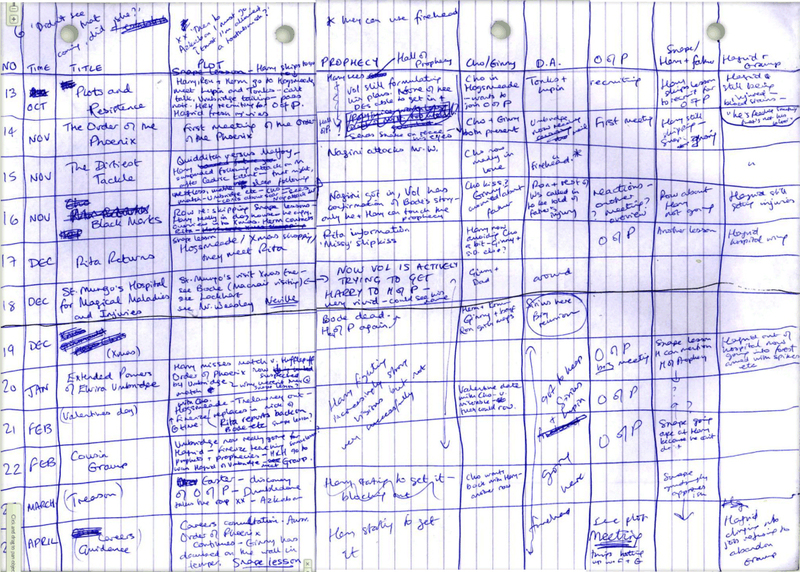 On the topic of Subplots, I recently viewed a handwritten outline of The Order of the Phoenix by JK Rowling (see photos), and I am curious as to how one would analyze this draft. 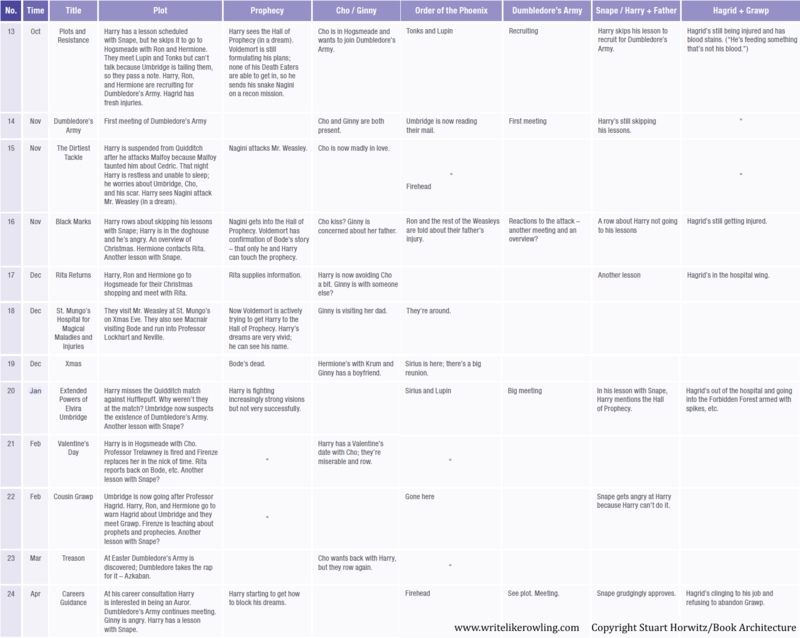 Would you consider these plot threads as the inner-workings of a single Storyform or as Subplot extensions, dipping into various Storyforms and selecting certain Throughlines, possibly down to the Concerns? For Subplots, how much of the Storyform is necessary to weave a Mystery Subplot, for example, into the main Storyform? All four Throughlines, with or without Concerns? Or, rather, would it be just as feasible to assign Genres to each of the four Throughlines in the main Storyform and scrap a Subplot, assigning, say, the IC Throughline as a Mystery? It's hard to say without analysing Harry Potter and the Order of the Phoenix in detail, but I'd suggest that most, if not all, of that outline is part of the same Grand Argument Story. Most of it being OS, with the "Snape / Harry + father" column being mainly IC, and both the Prophecy & Cho/Ginny columns containing a lot of MC. But again, hard to say for sure. Maybe there's a sub-story that includes Ron & Ginny's relationship (not really shown on that outline but a big part of the book) as the RS? Maybe the Hagrid & Grawp stuff is a substory? For writing, I'd suggest to work from a main storyform (however that best suits your process), and not worry too much about sub-stories at least in the first draft. I finished a big science fiction draft last month and was surprised to find afterwards that there were two sub-stories, each with full storyforms that I was able to find. Neither was planned, and one of them I didn't even suspect was there until it resolved! @mlucas With most of these plot threads seemingly within the OS, does that mean one could split Throughlines into different plot progressions, as the example shows, so long as the storylines support the Throughline's contributions to the Grand Argument Story? Would that confuse the audience if two storylines operate within the same Throughline, using the same story points? Maybe encoding these two storylines with different Gists would clarify the distinction yet remain similar in subtext? I don't think there's any problem with having different OS characters following different plot progressions as long as they follow the right Signpost order. In fact, Jim makes this pretty easy to do in Subtext by allowing you assign both groups and individual players to the OS so you can pull them in per Signpost/Act. Would that confuse the audience if two storylines operate within the same Throughline, using the same story points? I've thought about this myself. But I think you're right, the key is to encode them differently. But also keep in mind that each OS character should represent different Elements, so that should mix it up as well. What @Lakis said, and also, for the different storylines to be within the same OS, you'd want to make sure they all related (even if some only tangentially) to the Story Goal. Hmm. The more I think about it, the more I think there may be two separate stories within Order of the Phoenix -- one would have a goal of preventing Voldemort from getting the prophecy (Success but probably Bad, or at least with very high Cost), and one would be about Umbridge and Hogwarts. Hi @okcthunderx this is the Grid method of plotting. Storygrid does this, Book architecture does this and a few other story nutts as well. Most of these are ways to track the elements of the story. Be it OS or any Throughline. Ensures you don't lose anything in the process of plotting. It's a great way to ensure you see all the elements at play in your story. To add to this, the Dramatica software on mac has this (sort of). It's not chapterised or anything but it'll help you see and understand a storypoint.